I was just wondering in the Spencers mall in the skincare section and I spotted the Bajaj Nomarks All Skin types Facewash. I picked it up, as it was standing alone away from other brands and saw small pink granules in it. I just thought of trying it and purchased it. So today am reviewing Bajaj Nomarks All Skin types Facewash. The facewash smells very feminine like a scent or body mist. The fragrance is artifical but it's not bothering, rather it's sweet. The only thing I purchased it was the small pink granules. The granules are soluble in water and when rubbed on hand easily break. The facewash lathers quite well. The packaging is ordinary tube packaging with flip cap. The facewash cleanses the skin without stripping the oil. Post application the skin feels clean, fresh and soft. I am going to almost finish the tube and am searching for another tube in malls. I am very happy with the results of the facewash as it is affordable and delivers at the same time. Although it says it's for all skin types I don't know how it works for dry skin as I have oily skin. But I don't think it will dry out dry skinned beauties. I cannot say much about the mark free and glowing claims of the product. Cleanses the skin very well without stripping the oil. Availability - Available online and offline, I think this variant is not easily available. I totally recommend it and am hunting for another tube. I don't know why sometimes good brands don't get deserved attention or popularity. 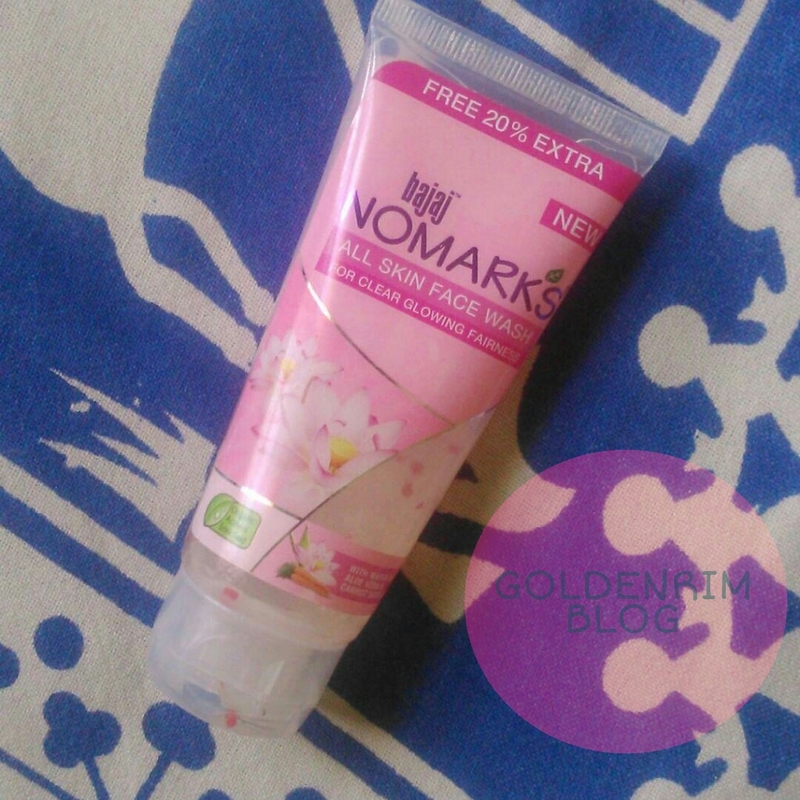 Bajaj Nomarks facewash is a good facewash to try and am sure you won't be disappointed at all. Of course it has parabens and artificial fragrance but almost all beauty product have it. If you get a chance do try out this facewash and let me know your experiences.